1. As sea level drops the upper portion of the carbonate shelf is exposed. The production of carbonate sediments slows as it is limited to the outermost portion of the shelf. The deeper slope and basin are limited in carbonate production to only planktonic productivity and possible delivery of shelf allochthonous carbonate by runoff. A narrow carbonate platform may form given sufficient upwelling and carbonate flux. The exposed carbonate shelf may be subject to diagenesis and karstification depending on climate, mineralogy, and time of exposure. Terrigenous clastic sediments are delivered past the exposed shelf and deposited within the shelf and basin. Submarine fans consisting of river sands are commonly found at the base of the slope. Incision and erosion of the exposed shelf are common results of fluvial activity. Prograding fluvial deposits may also protect underlying carbonates from dissolution and karstification (See Antecedent Topography). 2. As long-term sea level rises, carbonate productivity increases. Previous topography from fluvial erosion is filled by carbonate growth. The backstepping of facies as well as vertical accretion is common. High reef growth rates, which are only periodically stunted by drowning or onset of the oxygen minimum zone, can build thick carbonate packages. The accumulation of slope and basin sediments is a function of the barrier reef's effectiveness on controlling lagoon-to-open basin exchange and planktonic productivity. Often deposited upon the onset of this rise in sea level is a tidal flat sequence. 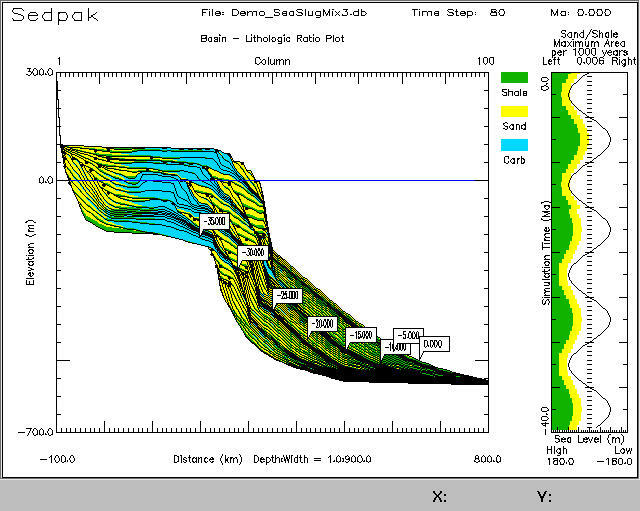 This deposit consists of a shallowing upward sequence with either sharp or gradational contacts. The fluvial valleys created on the shelf are filled and only minor sedimentation in the form of silts and clays occurs within the shallow subtidal zone. Offshore sedimentation is limited to sediments fine enough to be carried through the barrier reef (if any). A transgressive systems tract is often capped by a maximum flooding surface caused by sea level rise. 3. Most carbonate production diminishes as sea level reaches this maximum plane. For a period, reef buildup is able to keep up with rising water, building vertically and laterally as far as the shelf edge in some cases. Periodic exposure of accreting carbonate structures may result in minor diagenetic episodes. When sea level stops rising the production of carbonates essentially stops since both water level and shelf carbonate height are coincident. Only during minor episodic rises in base level can carbonate shelf productivity resume. The main region of carbonate production is on the shelf/slope margin where submerged slope deposits prograde outwards. Sediment gravity flows that export coarse sediment and carbonate blocks to the basin are common. Terrigenous clastics, like carbonates, fill the shelf as sea level rises. Initially, there is aggradation of sediments, followed by progradation. The extent of these two intervals is controlled by fluvial activity which, if efficient enough, can deliver large amounts of terrigenous sediment to the slope and basin (Illustrations from Walker and James, 1992). 4. Although not illustrated, it is implied that sea level will then fall immediately following the highstand illustrated in the previous diagram. This interval of sedimentation, called a falling systems tract, is characterized by a reduction in carbonate production and distal deposition of terrigenous silicalstic sediment. The shutdown of the carbonate factory is caused by the diminishing water column which eventually leads to subaerial exposure of carbonate platforms. Once exposed, fluvial systems advance over the platform and may not only erode and carry the associated carbonates off of the platform, but they also deliver silicalstic sediment to the slope and basin. The fluvial erosion may give rise to varying degrees of relief which, upon eventual transgression, provide not only space for carbonate accumulation but also surfaces for the development of antecedent topography (James and Kendall, 1992; Kendall and Schlager, 1981). Click on the following diagram for a movie of the effects of cyclical sea level fluctuation on both carbonate and siliclastic deposition within a shelf-slope-basin environment. Notice individual systems tract sequences associated with single sea level oscillation event. 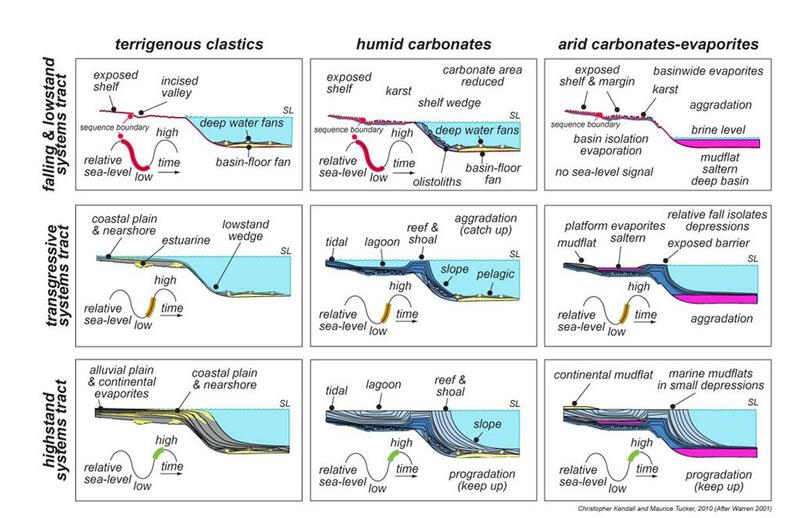 Also note how each sequence is bounded by unconformities created by falling sea level, and how tidal flat.